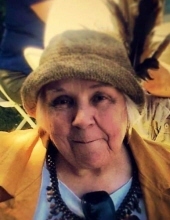 Carol Warner Christen passed away on December 24, 2018, in Garibaldi Oregon. Was 79 years of age and resided on a ranch outside of Yamhill Oregon. Carol was born March 1, 1939 in Cleveland Ohio to Robert Warner and Dorothea Hotchkiss Warner. She was the sister of Robert Warner Jr. and had many cousins in the Cleveland area. Carol grew up in Massillon, Ohio where she attended Washington High School. She attended The College of DuPage in Glen Ellyn, Illinois and the School of the Art Institute of Chicago. She was married on February 14 1978 to Joseph E. Christen III. Carol raised five strong and independent children from previous marriage, Michael, Ann, Linda, Karen, and Jane. These children produced seven Grandchildren Eleasah, Joshua, Brandi, Amy, Michael, Krista and Jaime, and 5 Great Grandchildren, Kendal, Oliver, Kelvin, Tyler and Elliot. All of them bright and beautiful. Her natural curiosity and intelligence led her to several careers. She was a voracious reader and her home library fills three walls of her home. She was a draft counselor for the American Friends Service Committee. She designed and created stage sets for the Edwin Albright Theater in Naperville, Illinois. Carol performed drafting and design for several Civil Engineering companies in Illinois and Oregon. Carol started several businesses including a Hypnotherapy practice, business bookkeeping services and office management. She edited books for two local authors. She edited two newsletters and coordinated the Yamhill Art Harvest for several years. Her ranch was home to 50 or so cashmere goats, chickens, ducks, turkeys, Guinea fowl, dogs and cats of course. She also cared for her mother Dora for the final seven years of her life until she slipped peacefully away in November 1997. Carol was a 20 year cancer survivor and fearlessly remodeled the 3 homes she lived in, ripping out walls and rearranging doors and windows. The interiors were painted with the style and skill of an art school trained set designer. She would copy a beloved Picasso painting onto an entire wall with stunning results. She had a particular charm that drew others to her sometimes without introduction. People would tell her things they would not normally share; somehow sensing that she had an answer. Carol’s life touched so many people in many ways and, I know, she will be remembered by many. A memorial Service will be held March 2, 2019 at Macy and Son Funeral Home In McMinnville, Oregon at 11:00am , a light reception will follow. To send flowers or a remembrance gift to the family of Carol Warner Christen, please visit our Tribute Store. "Email Address" would like to share the life celebration of Carol Warner Christen. Click on the "link" to go to share a favorite memory or leave a condolence message for the family.